When first impressions matter, choose the commercial painting contractor that can help you put your best foot forward. Palmer Pro has provided commercial painting services to local businesses since 2015. 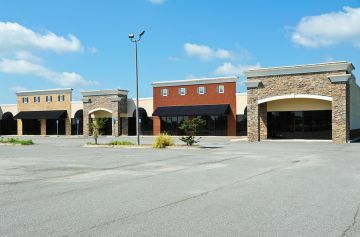 Businesses have trusted Palmer Pro to protect the exterior and interior of their office buildings and increase the curb appeal of many commercial properties in the area. Going beyond basic interior and exterior office painting, our team of professional commercial painters, our industry experience and solid reputation have have propelled us into becoming a valued and trusted local commercial painting company. Give us a call today for a quote on your next project. When you’re looking for a painting company you can count on, Palmer Pro has the commercial painters who deliver. Palmer Pro is a locally owned and operated business. We take pride in delivering quality results to improve the look of your business, making it a community icon that welcomes its staff and visitors. At the foundation of each project is preparation. Our comprehensive preparation process means we won't skip a step when caring for your property. First we patch small holes and handle any needed to drywall repair. The surfaces are then cleaned, sanded and primed before painting begins, to ensure a spectacularly finished product each and every time. We'll strive to exceed your expectations. Call (832) 410-1868 to get started. Have the walls and common areas of your office building become dull and dated? Let Palmer Pro take the ho hum out of your business with pops of color and a fresh coat of paint. If you notice the walls of your building peeling or bubbling, your customers will too. Our experienced commercial painting crew will brighten up your busy work space, making things look more crisp and clean. Are you considering a whole new look for your building’s interior or exterior? With so many colors to choose from, Palmer Pro will help you pick the perfect one to provide an energetic, welcoming atmosphere to any building and increase curb appeal. As a local leader providing quality commercial painting since 2015, it is our mission to ensure your business is looking it's best! Call Palmer Pro today for a free commercial painting quote at (832) 410-1868.